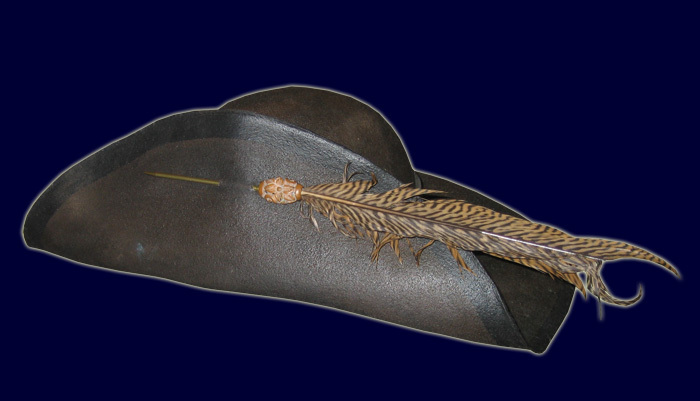 Reviewing a Captain Jack’s Pirate Hat is always a treat. For one, it’s a safe bet I’ll be able to write a favorable review (certainly more fun than the alternative.) But also, it’s always a treat to bask in the details of the new hat in question. While nearly every hat by Captain Jack starts its life as a near identical round felt blank, and the initial structuring and weatherproofing (optional) remains reassuringly consistent; the variations in color, style, and accessories make for a mind-bogglingly diverse range of end-products. The Captain Kidd style is a definite classic, with its upturned front creating a distinctive pirate look. Tricorns are can be worn by colonial soldiers, cavaliers can be worn by musketeers – but really, who but a pirate wears a front fold? Nobody, that’s who. And that makes the Captain Kidd really special. For some events I like to get away from the “typical” pirate look of black boots, black hat, black heart, black everything, and so I opted to order my Captain Kidd in basic brown, along with a couple of custom embellishments (the black stripe around the edge, and the pheasant feather pin in the front.) As has always been my experience with Captain Jack’s, the hat arrived well packaged and in perfect condition. The fit was perfect, as was the craftsmanship. The oil/wax treatment wasn’t as tacky as it’s been in the past, although the hat was certainly well coated and should handily weather all but the worst of conditions. The only concern I had was the length of the pheasant feathers, which rigidly stuck out what seemed a full foot and a half to my left – I was concerned I’d blind anyone standing next to me if not careful. But this was easily remedied – I simply broke the feathers off at what I determined to be the optimal length. While at it I also ruffled them up a bit, and put some subtle and not-so-subtle cuts along the hat’s brim to lend the effect of this hat being a true combat veteran. This has quickly become my favorite – and most often worn – hat from my Captain Jack’s collection. This isn’t because it’s inherently superior to the others – indeed, every Jack’s Hat I own is of the highest quality. But rather, it’s because its style best compliments one of my favorite pirate outfits. And this is perhaps one of Captain Jack’s greatest strengths – that each hat carries its own unique flavor and can create a wildly different effect depending on your clothing, face, and attitude. Purchasing a Captain Jack’s hat is more like acquiring a loyal sidekick than an article of clothing, and so I’d always encourage potential customers to think hard and choose carefully. You can’t really go wrong with a Jack’s Hat, but if you take your time and exercise some creative foresight you can select a hat that will convert a typical pirate look into one that’s uniquely extraordinary. I will admit that not only should this hat get 5 stars, but just about ALL of the Mackay’s should be 5 stars. Yaaaaar because it doesn’t matter what you ask him to make, it will always come out a beauty of great quality! We just bought our third Capt Jack hat… this one was also a Captain Kidd hat, and I’m with you, ALL of his hats are just so spot on. And each style transforms what you are doing with your garb in such great ways. They are just great hats made by a really good guy. I purchased a Long John Silver from Cap’n McKay and had no problem with the order or the hat. Three Cutlass Up for Cap’n Jack Hats, Huzzah! Capt. Jack McKay’s hats are great. Unfortunately, they will be closing shop effective the end of April. Sad news! Aaaargh,Me Bucko…Jeff makes the Best Hats..Baaarrrr none..Jeff,from my understanding is taking a breather from making hats…I’ve 4 different styles;one ,of which,is named the LaVasque,for that more Noble Pirate in Mind..I’ve order the last one He be making for me..A Buccunner style,until he re-opens is Haberdashery again,,then I’ll get Moi a Capt.Kidd..Thaaarr Be several different in Me Bones,Savvy! !..Enjoy your CaptainJackPirateHats,Me Heaties!! Aaaarrgh,Me Buckos,..Master Jeff makes the Best Pirate Hats Baaarrrr none..Jeff,from my understanding,is taking a breather from making hats..I’ve 4 different styles;on of which,is named the LaVasque,for the more Noble Pirate in mind..I was able to get Jeff to make me another in me collection..The Buccaneer.Until he re-opens his Haberdashery again..I’ll then get me a Capt.Kidd one..as thaaarrr be several different Pirates in me Bones..Savvy! !..Enjoy your CaptainJackPirateHats,Me Hearties! !…Please disregard the 1st post as I ‘m quite tired and need rest and I need to learn to spell and complete my thoughts,lol..Take Care all! !